Upstairs, Downstairs debuts as a part of PBS’ Masterpiece Classic series tonight. It will air at 9 p.m. Eastern and Pacific/8 p.m. Central and Mountain in most markets, but you should check local listings. So is there room for a revisit to the world of Upstairs, Downstairs? Before mainlining the three episodes of the new series, I would have said no, since this is now well-trod ground, rather than anything new. But after watching these three, I’m intrigued enough to know I’ll watch more when the series returns. By trying to condense what would be about a half-season’s worth of plots from the original series into just three episodes, the new series does itself a bit of a disservice, and there are some curious shifts of emphasis when compared to the old series. But on the whole, Upstairs, Downstairs is a worthwhile piece of television, filled with smart little touches and sophisticated character beats. There’s a discovery in the third episode that hasn’t worked since the days of Charles Dickens and Wilkie Collins, but the series almost gets away with it, thanks to taking the idea seriously. The best decision the series has made is to be a continuation of the original series, not a remake or “reboot.” Six years have passed since the last series ended (with the Bellamy family in such need of cash that they sold 165 Eaton and cast the service staff to the winds), and the house from the original has sat empty all this time. With good reason: The Great Depression is stretching on into yet another year, and the families with “old money” are increasingly destitute. Fascism is on the rise across Europe, and even England sees the stirrings of the dictatorial movement. A new king, with rumors of an American mistress, has risen to the throne, and everyone in England is attempting to solve the question of just what Adolf Hitler is up to and whether it will mean war for the U.K. The original Upstairs, Downstairs firmly cast its lot with the servants and then gradually brought in the world “upstairs” as it went along. (It was fond of all of its characters, from the lowliest maid to the king himself, and it took pains to develop all of them over the course of its five seasons.) 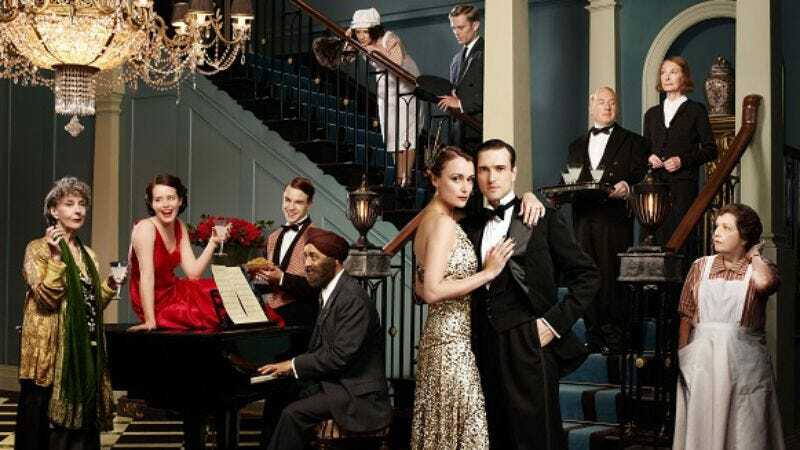 This series is the exact inverse, beginning with Sir Hallam Holland (Ed Stoppard) and his wife Lady Agnes (Keeley Hawes), as they decide to enjoy some of Hallam’s wealth by buying a large, lovely house and outfitting it with all the latest, most glamorous things and hiring on a servant staff. Much of tonight’s first episode is concerned with reintroducing 165 Eaton for the audience and letting us get to know the Hollands and Hallam’s mother, Maud (original series co-creator Eileen Atkins in a hysterical performance) and Agnes’ sister, Percy (Claire Foy, who has one of the most marvelously expressive faces in a medium known for favoring marvelously expressive faces). The servants enter the story only gradually, and the series takes more pains spelling out who the upstairs characters are in the early going. Indeed, much of the first hour coasts on us having some affection for Rose Buck (Jean Marsh, the other co-creator of the original series and an Emmy winner for her work as Rose in that series), who’s the sole character link to the old show. In general, those who’ve never seen the original can watch this without missing a beat, but some of Rose’s dialogue (as well as a few touches around the edges of the set design) will be filled with wonderful little treats for those who loved the original show. Rose assembles the staff that will serve the Hollands, and over the next two hours, the servants get more of the screentime, as was often the case in the original series. But with only three hours, things end up feeling incredibly rushed here and there. Each episode takes place over the course of several months, and a pregnancy discovered early in episode two is very nearly to term by the end of that hour. The original Upstairs, Downstairs would often have seasons that took place over the course of several years, but the episodes themselves would usually take a tighter focus, a tighter focus that’s missing here, as characters’ journeys through various political movements or toward a certain harshness toward other characters sometimes seem to take place solely for the plot’s sake. For every lovely character beat—like Maud and Agnes bonding in an unexpected moment late in the third episode—there’s another that feels incredibly forced—like Percy making an announcement to Hallam in that same episode. Series’ writer Heidi Thomas does her best to delineate all of these people in as little time as she has (and offers up several nice, stealthy nods to the original series for those paying attention), but episodes will often seem to be filled with loads and loads of STUFF, until something that was important early in the hour will come back unexpectedly at the end of the hour to an audience that had largely forgotten about it. Furthermore, there are so many servants that a few of them suffer in terms of character development, particularly butler Warwick Pritchard (Adrian Scarborough), who often seems to just be Thomas’ riff on Oliver Hudson from the original series. Yet at the same time, there are enough interesting characters here—like Maud or her Indian manservant Amanjit Singh (Art Malik)—and enough intriguing plot twists that it scarcely seems to matter. Americans may be slightly burned out on stories involving King Edward VIII’s abdication of the throne to be with Wallis Simpson, but the series makes great use of that historical event in the background here, and its examination of British fascism is both thought-provoking and a little clumsy (as when a character shows up for supper in a fascist uniform and everyone stares at him as if he were in a horror film). In particular, the series’ second hour—focusing on a Jewish woman fleeing Germany and finding a home at 165 Eaton, even as fascists are taking to the streets of London—does stellar work with these historical stories and the characters struggling through them. And even if, yes, things move a little quickly here and there (and with poor character motivation), Thomas takes time to slow things down and just observe these people at their best and worst. Upstairs, Downstairs is full of so many sophisticated little touches in its abbreviated first series that I’m certain the series will find a way to fix some of these problems as it goes on. Watch, for instance, for a marvelously sensual scene between two young adults tonight that never shows any skin and takes place with a closed door between the two. Or look next week for a scene where the servants listen to the radio and try to imagine what kinds of drinkware the live audience is drinking from. Or check out the way that Hallam knows a certain character has left his house in the third episode, something the series conveys with a well-chosen visual. Upstairs, Downstairs isn’t top-flight TV quite yet, but it knows all the moves. It just needs a little time.